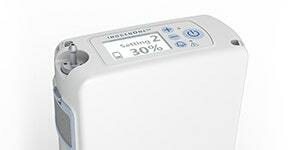 American Medical Sales and Rentals (AMSR) and the Oxygen Concentrator Store are excited to announce the release of the all new Inogen One G4 Portable Oxygen Concentrator. This new and improved addition to the popular Inogen line is compact, lightweight, and user-friendly. At just 2.8 pounds, the Inogen G4 is approximately half the size of its counterpart, the G3 which weighs in at just under 5 pounds. The G4 grants users ultimate freedom by easily charging via wall outlet, DC outlet in your car, or for hours at a time with each rechargeable battery. “The Inogen G4 can be used as a stationary, portable, travel, or day and night oxygen concentrator!" Inogen is known for their convenient units which is why the G4 has been designed to be a single oxygen solution. The G4 can be used as a stationary, portable, travel, or day and night oxygen concentrator. Featuring 1-3 pulse dose oxygen delivery settings, the G4 never has to be refilled. This portable concentrator is meant to dramatically increase convenience and independence and is oxygen ready at home or on the go. Contact the Oxygen Concentrator Store to learn more. With more than 20 years experience in the industry, they are one of the largest web-based providers of oxygen concentrators. AMSR provides the highest quality service available. Their mission is to help the customer get the best product for the best value when renting or buying an oxygen concentrator, as well as by providing the best on-going customer care. They are home to one of the largest inventories of portable and home oxygen concentrators as well as CPAP Machines. Additionally, the American Medical is accredited by the Better Business Bureau with an A+ rating.